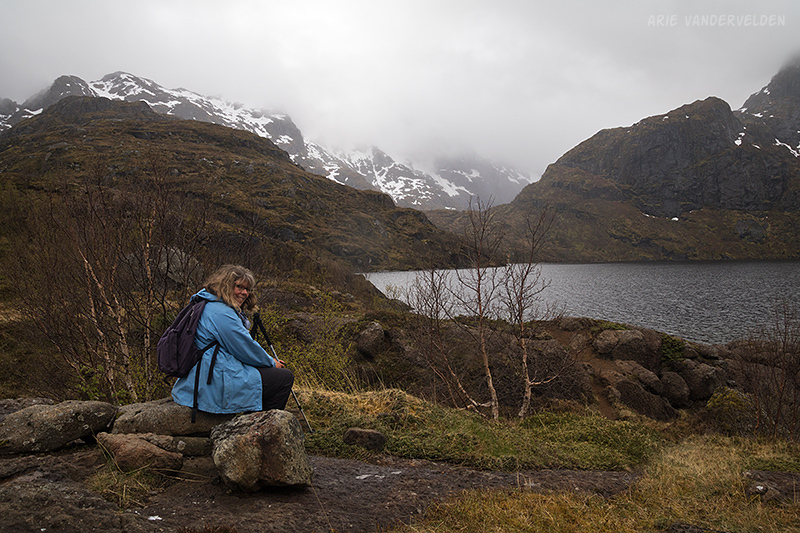 We started our Lofoten trip in Tromsø (read part one of our journey). 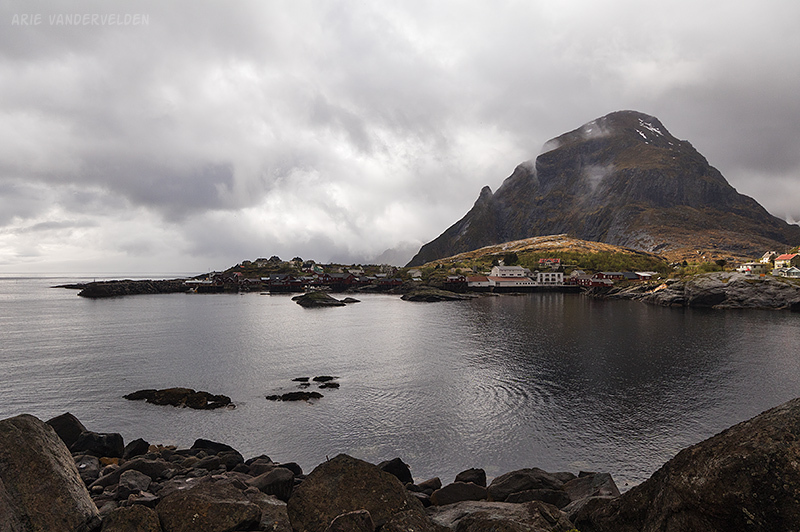 We drove across the island of Hinnøya (read part two of our roadtrip), and we stayed in the town of Svolvaer on Austvågøya island. 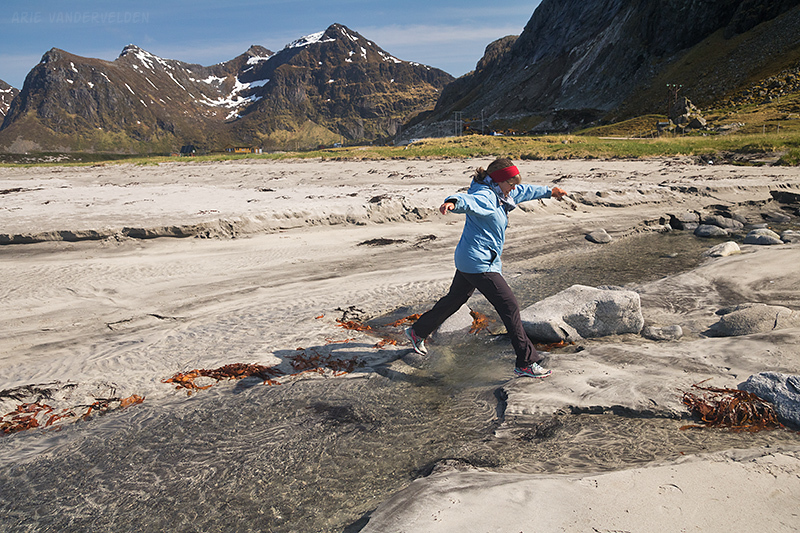 Flakstadøya and Moskenesøya are the two outermost islands of the Lofoten island chain that are car-accessible. Driving from Svolvaer we passed the island of Vestvågøy along the way. Vestvågøy is less interesting than the two islands that follow, so I’ll fast-forward to Flakstadøya. 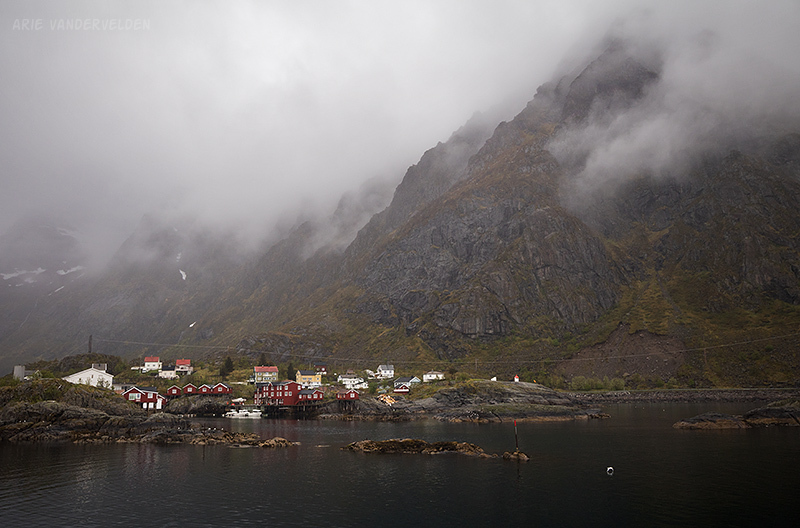 Our first stop was at Nusfjord, a pretty village set in a narrow little cove. We wandered around the village. 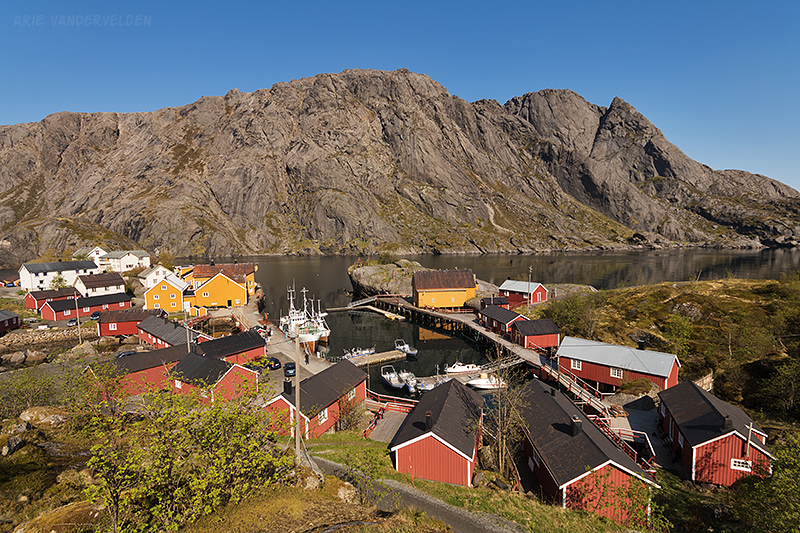 The village has a boardwalk that goes around the inner harbour where some fishing boats were docked. 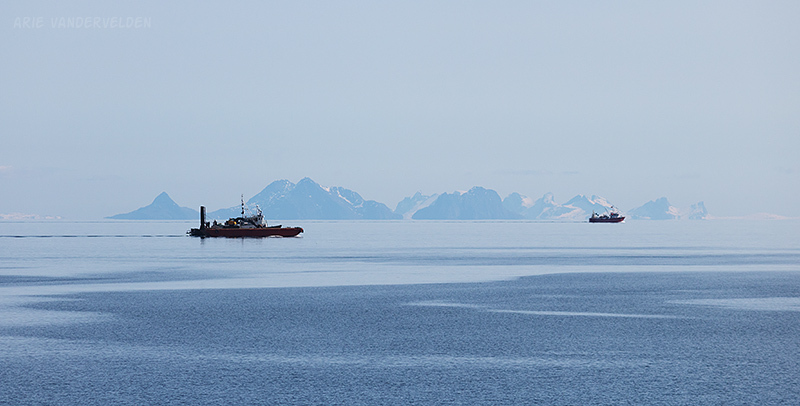 From the top of the hill we could see some ships plying the waters between the Lofoten island chain and the mainland. 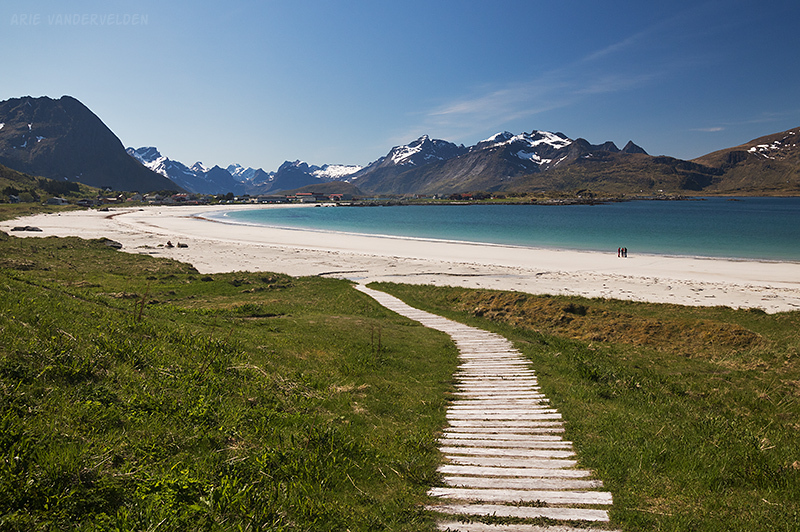 Just down the road is the village of Flakstad, where there is a spectacular beach. We had lunch at the picnic table and then set out to walk the length of the beach. The tide was ebbing, and some water was trapped on the beach behind a sandbar. This shallow water on the beach produced some nice reflections. After a while the beach petered out at a pile of seaweed, and we returned the way we came. 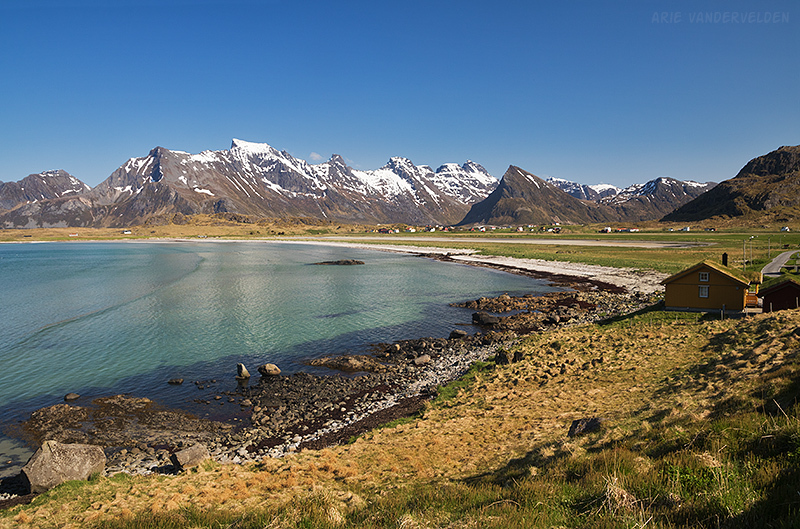 Just down the road, at the town of Ramberg, there is another long sandy beach. The white sand and aquamarine water looks much like a Caribbean beach. This got me inspired to put on my swimming trunks and to go for a dip in the sea. Don’t be fooled by the tropical looks. The water was freezing cold. I jumped in, swam a few strokes (feet off the ground) and came back out. 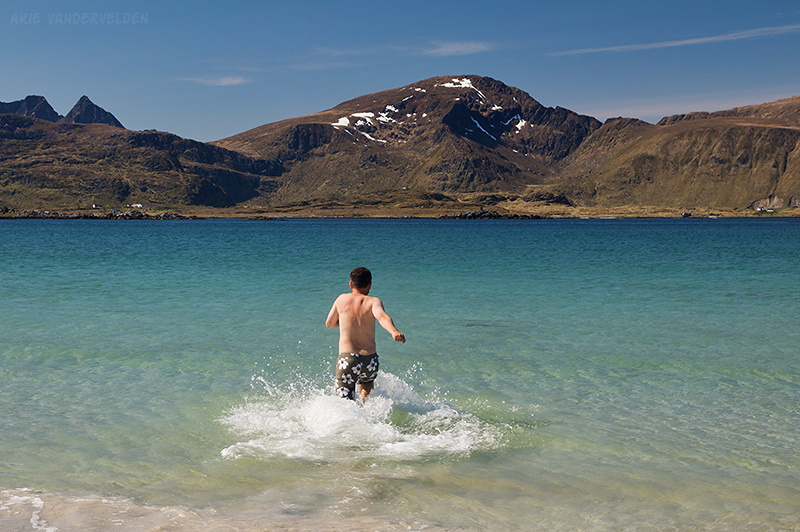 I’m counting this one as a dip in the Arctic Ocean and not the Atlantic. 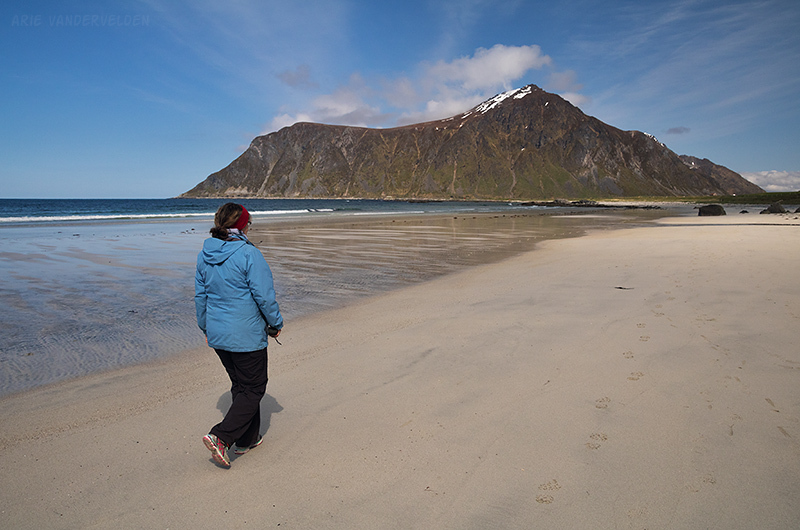 Some may argue the Arctic Ocean starts north of Svalbard rather than north of Iceland. 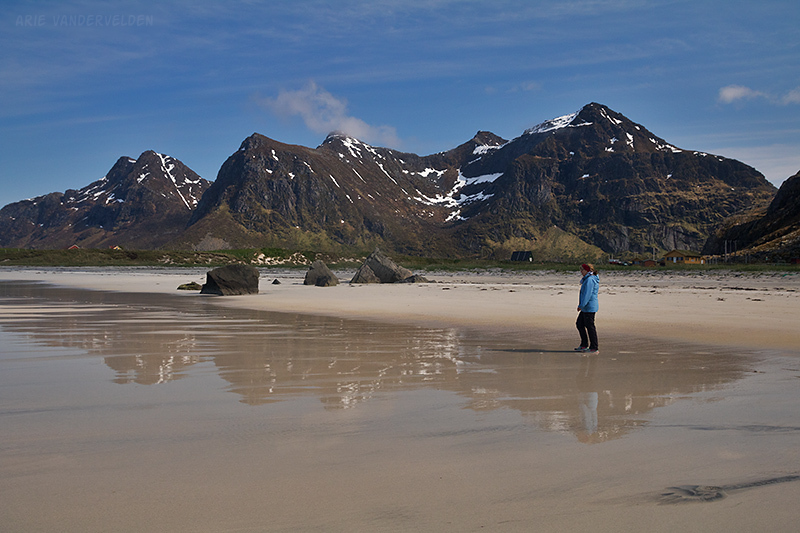 However I was well north the Arctic circle and this part of Lofoten faces north. Good enough for me. We drove out to Ytresand, another white sand beach. This one is not as wide as the others, but the setting is very nice. 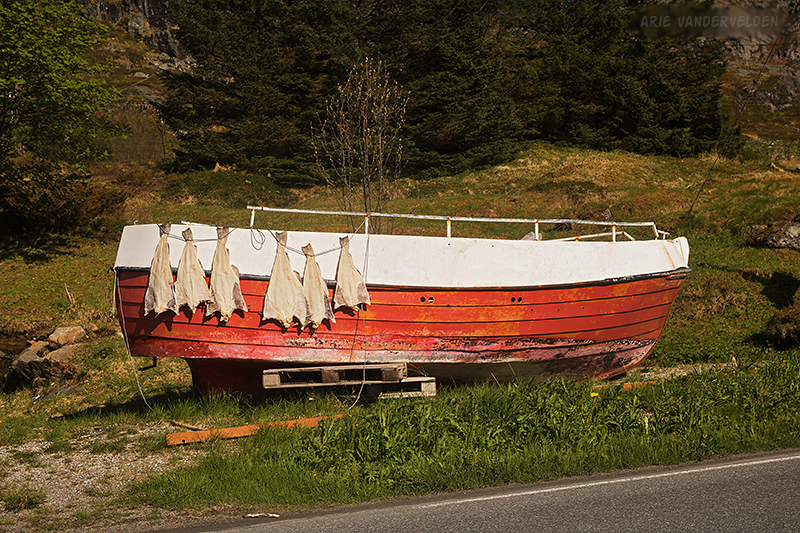 In one yard we spotted an old boat now being used as a cod drying rack. Drying cod on an old dory. 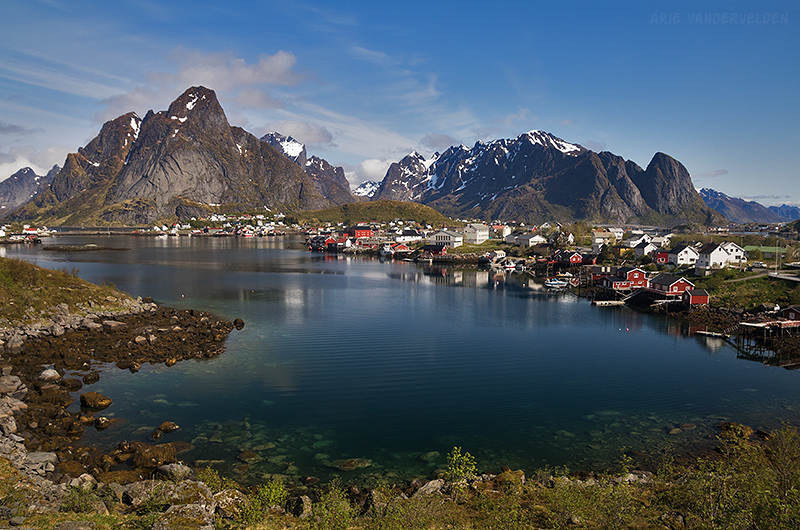 Reine is a town on a few skerries in front of a wall of towering mountains. 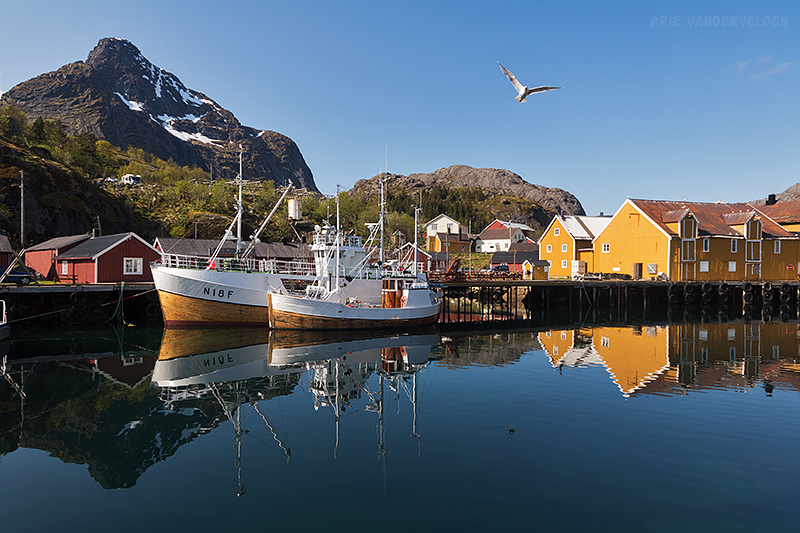 The setting is absolutely spectacular, and more than once it’s been named the prettiest town in Norway. 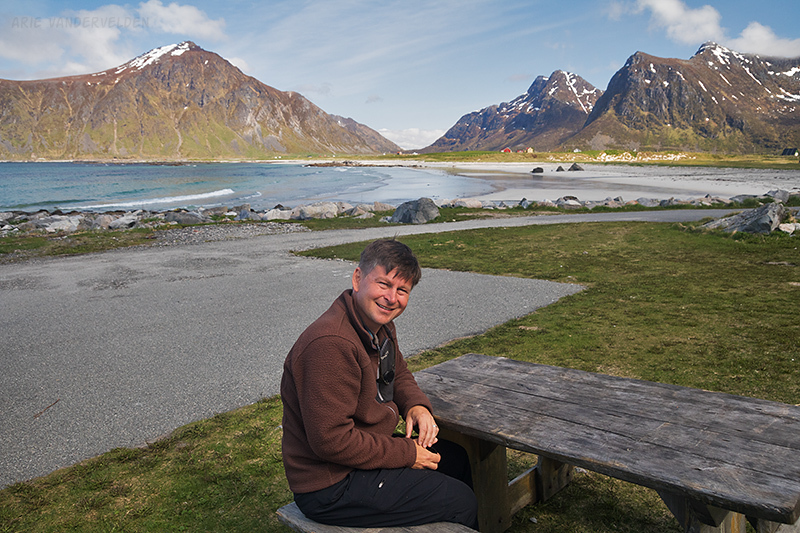 We stayed just outside of Reine for a few days at Sakrisoy Rorbuer. I’ve put pictures from here in a separate post. The road ends at Å. Yes, that’s right, the name of this town has only one letter and is pronounced like a grunt. I imagine there must have been a conversation like this in the past: What shall we call this town? Uhhh… Great name! Let’s call it Å! 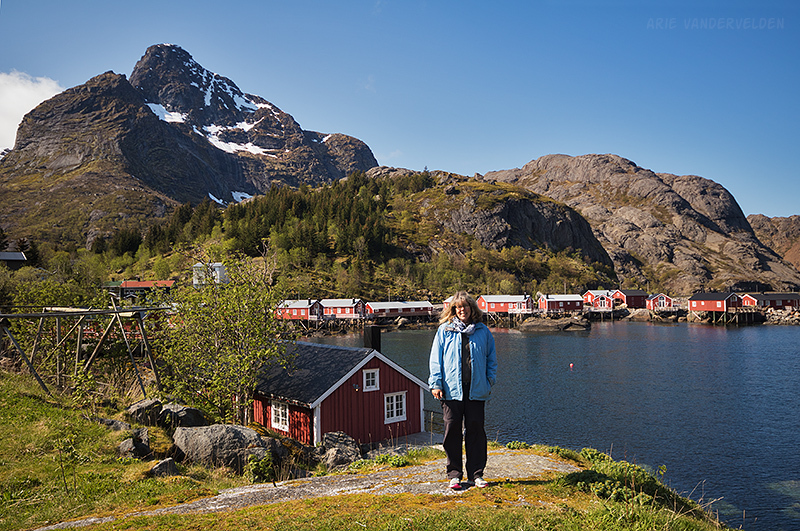 Å is as far as you can drive down the Lofoten island chain. 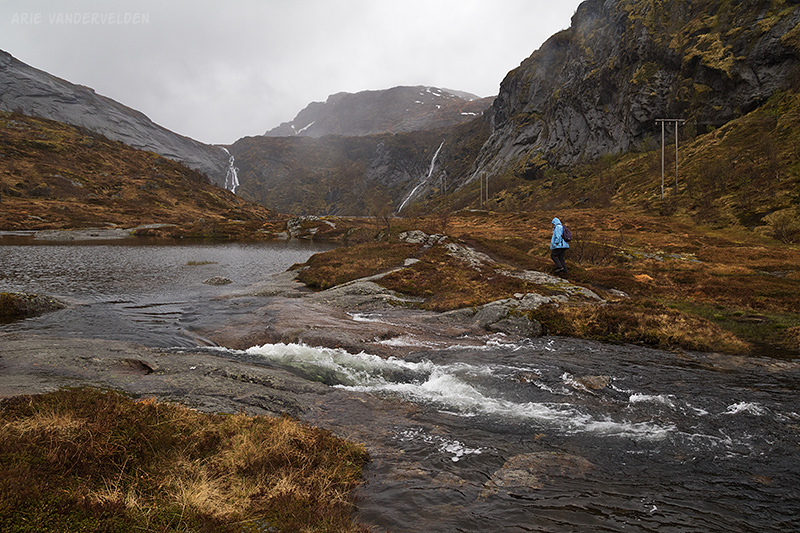 We visited Å on a cloudy and rainy day. Clouds swirled around the mountains, and it rained off and on. 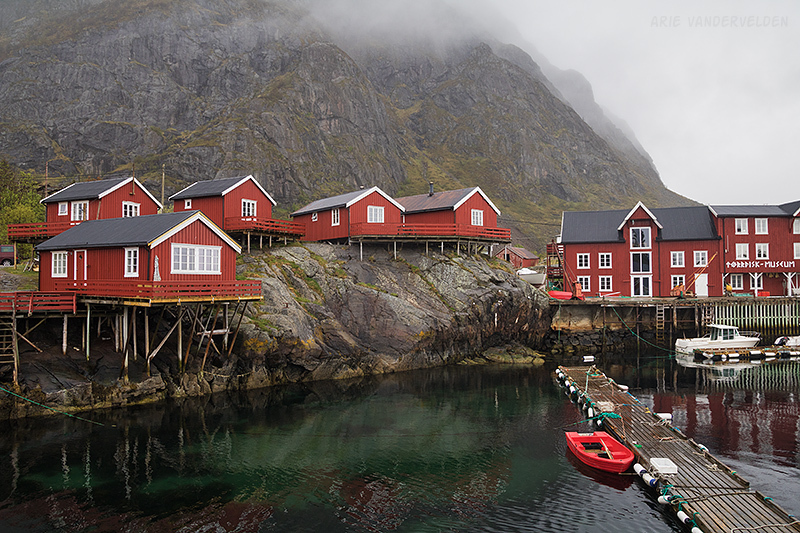 Oxblood-red cabins sit perched on poles at the edge of the water. 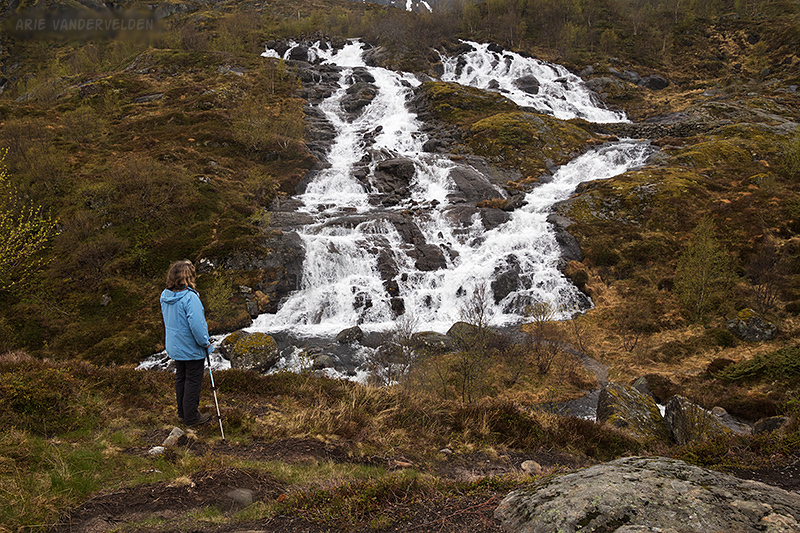 Just outside of Å we found a hiking trail leading into the mountains. The trail led past a waterfall. We followed the creek upstream. The trail was quite soggy but we had our waterproof boots on. We stopped at a lake and contemplated the bleak scenery.